We are a leading Wholesale Trader of bench scale from Ahmedabad, India. Our organization is known in the industry for catering a distinguished segment of Bench Scale. 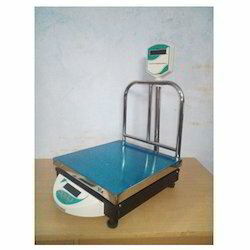 Offered bench scale is manufactured by using high quality of material & modern techniques at our working unit keeping in pace with market standards. This bench scale is appreciated in the market owing to its durability and optimal strength. We provide this bench scale in several specifications as per the needs of customers.